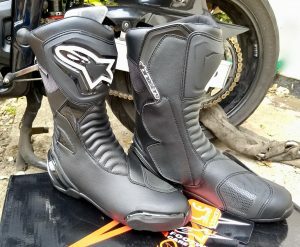 For a number of years I have stuck with the Alpinestars SMX range of boots, starting with the 4’s, then 5’s, then 6’s, the race Plus version and now I’m onto the SMX S waterproof boots. With so many slight variations, it’s tough to work out how they differ and when shopping around who indeed is selling which cheapest. 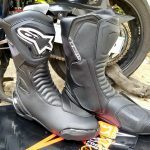 Here I’m going to go through the key differences between the current S-MX 6 and SMX S boots. If like me, you ride year round, rain or shine, you really need waterproof boots. 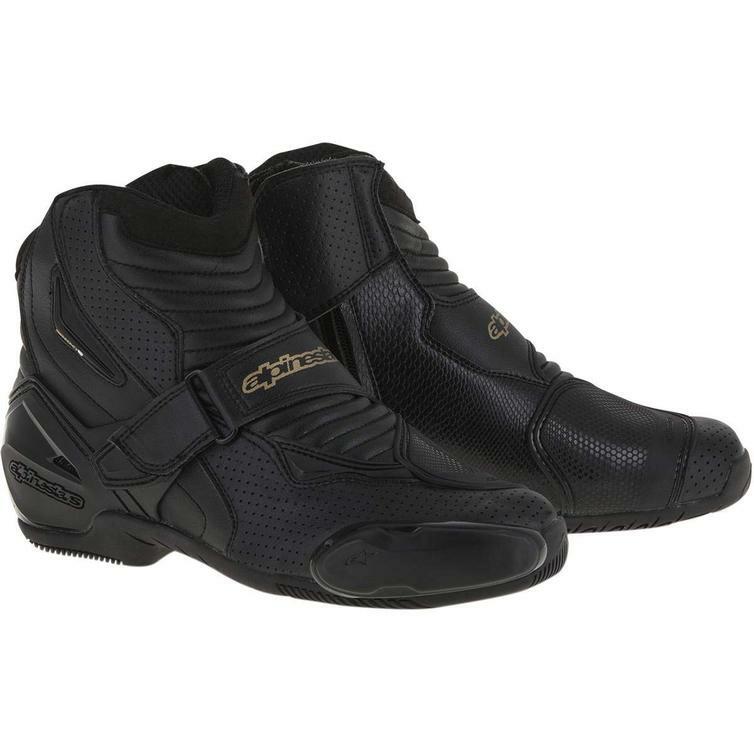 Throughout the Alpinestars range of boots there are ‘WP’ waterproof variants which usual retail for a little more. These have a waterproof layer within that really does keep your feet dry, even when wading in puddles. 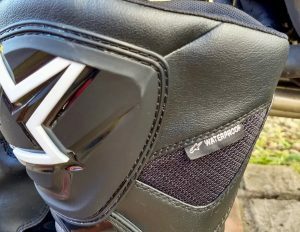 You can double check you’re looking at the waterproof versions, by checking the inside white label and by presence of little ‘waterproof’ ribbon label sewn on side of boot. 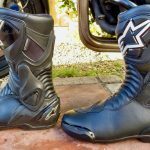 The new SMX S boots are more of a daily street orientated boot. Compared to the S-MX 6’s, they’re slightly more lightweight, the external ankle armour plate was been swapped for smaller built in protection. 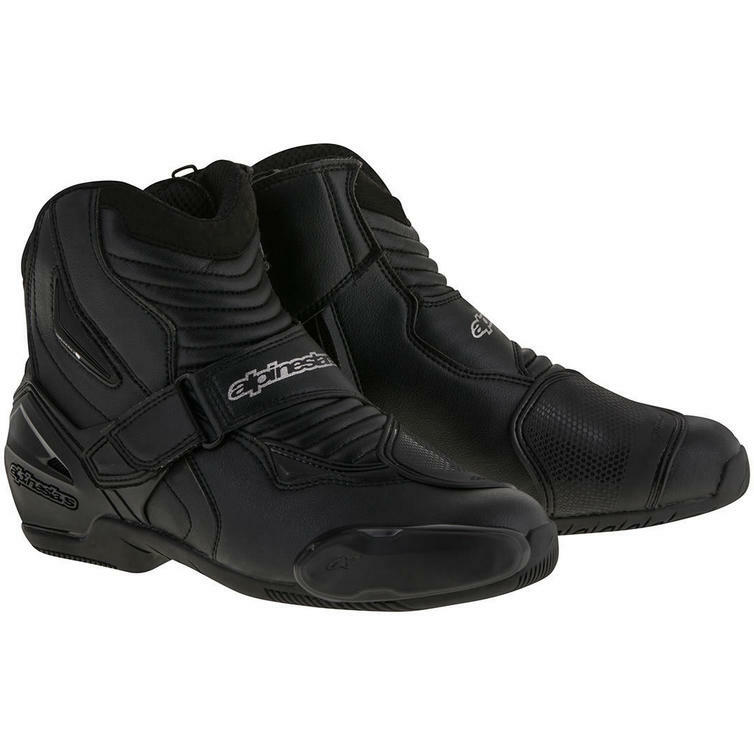 The calf plastic armour is reduced and protrudes less, making it easier to wear trousers over them. 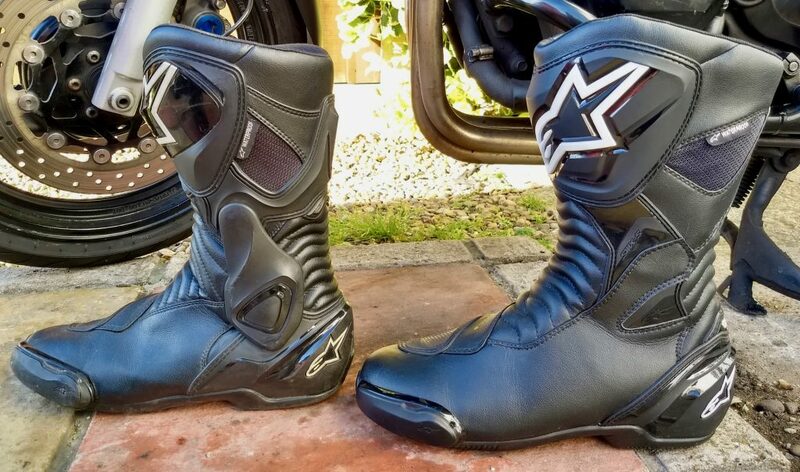 The rest of the two boots is cosmetically very similar, rear heel protection, toes sliders, gear lever wear patch on top of toes and zip-Velcro flap fastening; all near identical. 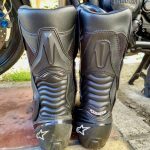 The soles on the SMX-S boots have a different tread pattern and are a little more grippy, which can make a big difference when you stop and put your foot down on a wet or gravelly road. Comfort wise, both boots are very similar with no discernible difference. After wearing either all day to ride hundreds of miles I’ve not experienced any discomfort. Similarly when walking around for any length at a destination, no complaints at all. In the cold all the SMX’s hold up well, with a thick pair of socks I’ve only had numb toes after several hours ride in sub zero temperatures. 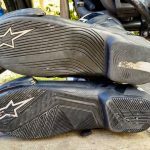 In the summer they can however be quite toasty, when it gets above the mid 20’s and into the 30’s (Celsius), your feet do feel like they’re getting cooked and the boots quickly get smelly – ewww! 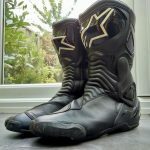 I find my SMX Plus race orientated boots fair better in the summer with their additional ventilation, but are by no means cool. 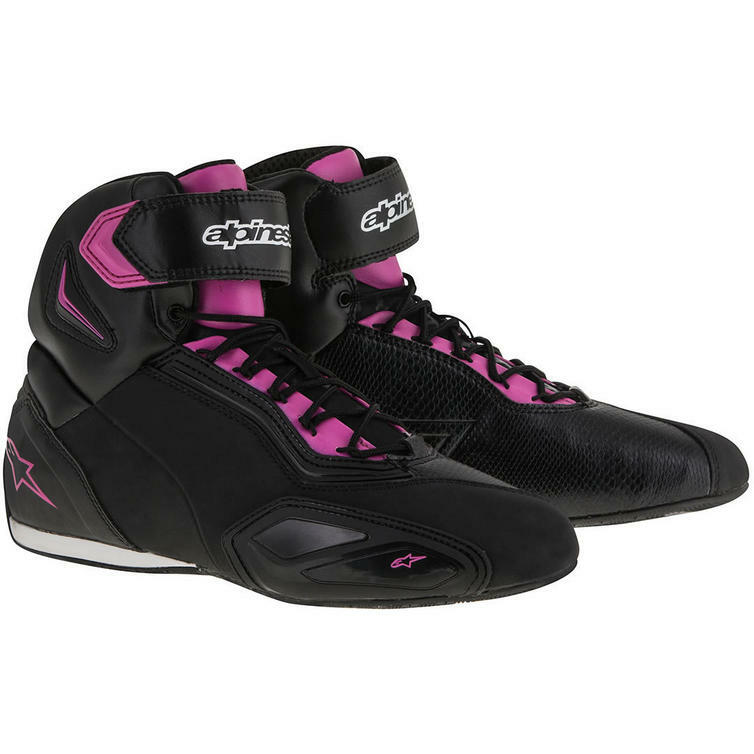 A shorty boot like the SMX 1’s may be a better prospect when very hot. 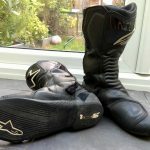 I’ve not crashed tested the S-MX 6 or SMX-S boots (yet!) but have had a couple of off’s with old S-MX 4, S-MX 5’s and my SMX Plus on the track. In all instances the boots protected me well, nothing broken. Worst case was a small bruise on my ankle when my bike came down on my leg when wearing the S-MX 4’s and I had to pull myself out from beneath. In all instances, I walked and rode away. As such, I have every faith the latest Alpinestars boots will protect as well, if not better. Granted the SMX-S boots have less armour than the S-MX 6, however they have a similar amount to the older S-MX 4 and 5 boots. From a longevity and durability point of view, the boots hold up pretty well. I wear mine daily for commuting year round all weathers and at most weekends for ride outs and touring. 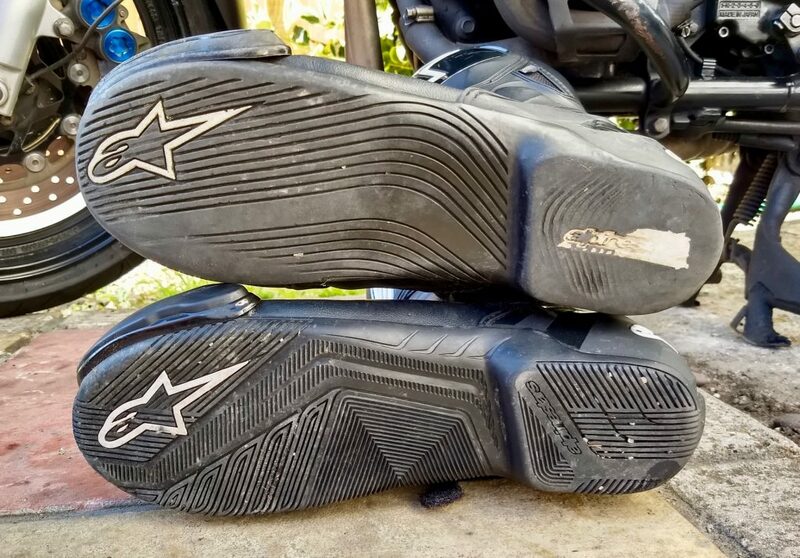 I find it is the soles that wear first, with the tread all smoothing off which can cause you to lose footing when stopping. Then the soles will eventually wear through and then the waterproof protection fails. 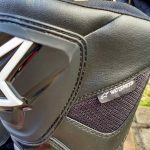 The Velcro can sometimes start to fray away from the leather and the Velcro pull on the zip sometimes comes off, but neither particularly serious. These are the only failure points I’ve seen and I usually get a couple of years out of a pair before replacing. So big question, which pair do you go for? Really depends on your riding and budget. The S-MX 6’s are more expensive, but have greater protection. The SMX-S’s are cheaper and are slightly more orientated for a casual street riding. For me price won out, especially when GetGeared had the SMX-S’s in a 20% off flash sale!